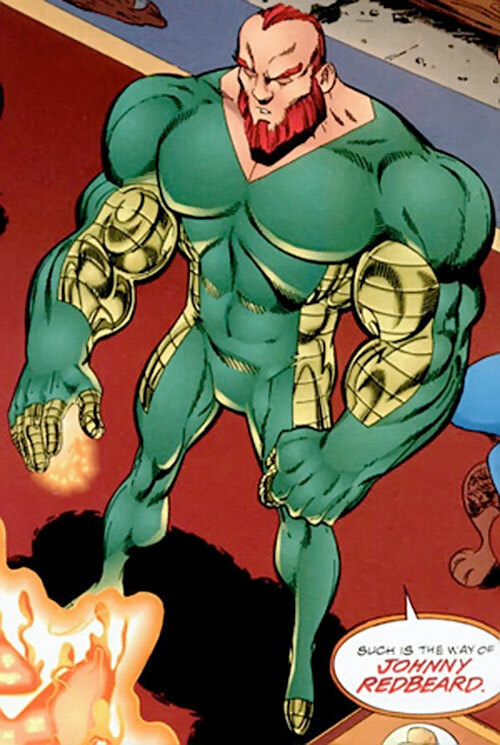 Johnny Redbeard is a relatively early Savage Dragon character, who appeared in 1994. He is a walking generator of mostly-forgettable super-villains, who can field small armies of guys with mostly random powers. So if that’s your thing, the draw is obvious. Real Name: Unrevealed (I), Chelsea Nirvana (II). Other Aliases: The Creator (both), Johnny Redbeard II & Mighty Man III (Chelsea Nirvana). Johnny Redbeard has the power to grant superhuman abilities to others. These abilities are very powerful, but hard to control. Redbeard is a charismatic criminal leader. Redbeard also has a large physical frame, and although no fighter, he is supposedly strong. The original Johnny Redbeard was working on creating his own army of superhuman freaks while living a life in luxury. That lasted until he was murdered by Chelsea Nirvana who stole his power and became his successor. Numerous super humans owe their powers to one of the Redbeards. Freak Force had only been active for a few months and was advertising for a secretary. Chelsea was the only applicant that was not scared away by the various members of the team. Thus, she was hired. Gathering information about the heroes, she discovered the nature and origins of Mighty Man II. She eventually met up with the Inhabiter. The pair soon became lovers and plotted their own mutual revenge plans on Freak Force (Inhabiter had a strong hatred for Barbaric and Ricochet). Chelsea and the Inhabiter’s plans finally came together when they murdered Johnny Redbeard. They then had his powers recreated into Chelsea. She became an incredibly attractive woman but soon realized she was slowly becoming identical to Johnny Redbeard. Chelsea created the Henchmen and led them with Inhabiter. They temporarily allied with Freak Force so that they could liberate the MMMS camp and gather an army of freaks to later further their goals. Soon after, the Gang War tore through Chicago. Freak factions were fighting for control of the Vicious Circle now that OverLord was deceased. The new Johnny Redbeard II further added to his/her ranks by creating Bludgeon II but not even his might was enough to defeat CyberFace’s group. 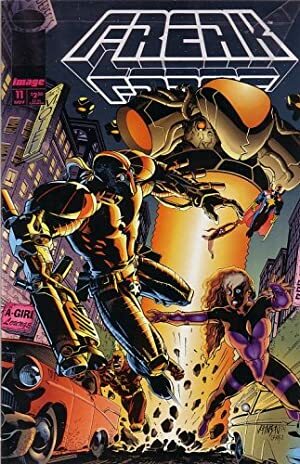 CyberFace utilized his immense powers to murder five of the opposing freaks and stopped Bludgeon II in his tracks, just to demonstrate a fraction of his might. Negate was then used to remove Johnny Redbeard II’s powers. Oddly enough, he reverted back to a male form instead of Nirvana’s original female form. Chelsea Nirvana continued her criminal activities in human form. But the threat of Johnny Redbeard was seemingly over. In the dimension known as the Savage World, Johnny Redbeard had mutated into the more powerful being known as the Creator. Johnny Redbeard is an impressively large and muscular male with great stature. He stands tall and proud and when along his minions there can be no doubt about who is the leader. Johnny Redbeard is an arrogant man with delusions of grandeur. Only Redbeard may decide who is worthy of his gift and who is not. However, in practice, his granting of abilities seems more or less random or arbitrary. Redbeard is a great speaker. He will work his will behind the scenes, slowly gathering an army. Redbeard will often play out social Subplots with his minions, much like a planning mastermind. He will taunt, gloat, threaten and impress. He seems to believe that his ability to grant superhuman abilities to others makes him a leader of everyone. He will live a complete life of luxury, which includes the enjoyment of whatever his minions have to offer him. In general, Redbeard uses misfits and madmen as the subjects to acquire the power, presumably because he believes them to be more easily controlled as a group. He also believes himself superior to his creations even though they are physically often more powerful than himself. He will treat everyone like a minion, even people he has never met before. Redbeard seems intent to overtake the city for his own purposes by means of his private army. 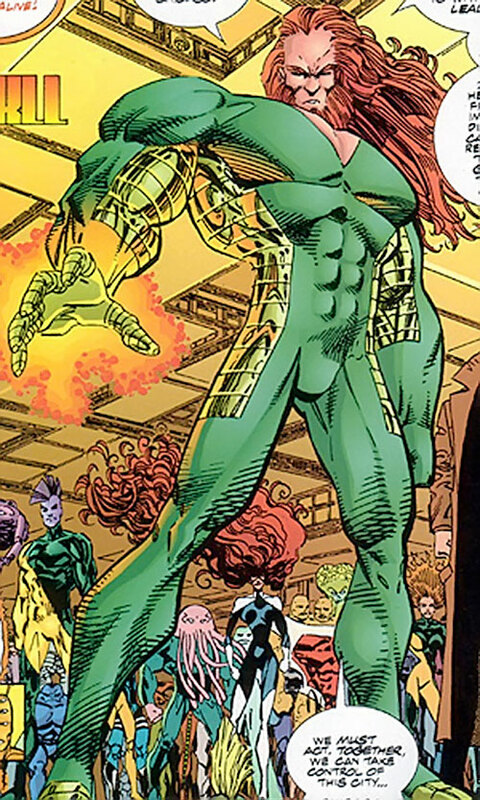 The concept of Johnny Redbeard is quite unique having similarities in power only with cosmic characters such as Marvel’s Silver Surfer and Galactus, or the less known mutant known as Infectia, and her gang, the Anti-Bodies, from the early X-Factor issues. 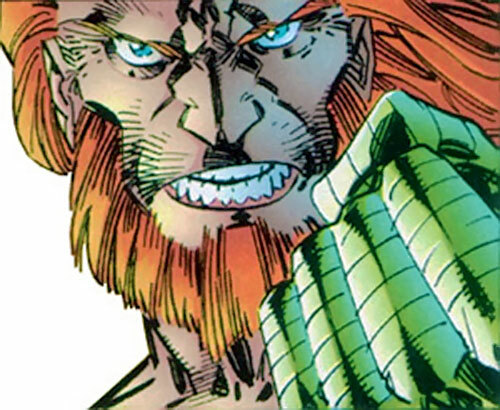 Redbeard’s greatest success could have been artificially created villains such as Deathstroke the Terminator, and he could somehow be involved with the creature known as Doomsday (since Bludgeon is a clear homage to Doomsday). No doubt, the army of Redbeard would have clashed with an early incarnation of the Justice League of America. RAPs on the Mutation Check add to the APs of the rolled Mutation(s) (+3). Both the Strange Appearance drawback and the mutation created can be temporarily controlled by paying appropriate HP fees, according to the GM, at creation; if so, the severity of Strange Appearance can be reduced and the mutation be selected (non-random) (+1). Mutation has Serious Power Burnout Limitation (-2). Whenever Mutation is used there is a risk of lethal transformations (see below) (-1). Pyrokinetics is both Contingent on Mutation and Uncontrollable (-2). Johnny Redbeard’s creations (High), The Nixed Men and She-Dragon (High)(both Redbeards), The Frightening Force (High; Redbeard II only), The Inhabiter (High; Redbeard II only). RAPs from the Mutation roll may be added to the APs of the rolled Mutation (or Redbeard may himself select the mutation by paying a HP fee; Bonus). The RAPs can also, alternatively, and as seems to be the norm, be spread out on the various Attributes and Powers of the subject making the subject less powerful, but more balanced (Bonus). 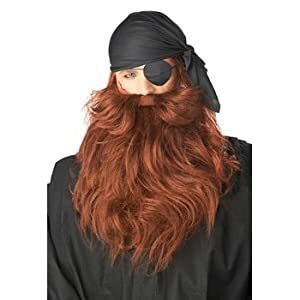 The subject will receive the Strange Appearance drawback (standard Mutation) unless Redbeard chooses to reduce this effect by paying a HP fee (Bonus). Approximately one of every six receiving the power will succumb to its negative side effects and die in the process of receiving his powers (Limitation). In fact, a control roll might be rolled using a six-sided dice at the recreation moment, a ’1’ leading to the fatal effect, and resulting in an attack by Redbeard’s Pyrokinetics power against the subject’s BODY score before the mutation has taken place (a fatal error in the being’s new biochemical and biological makeup). A very powerful subject being mutated would supposedly survive this effect. Redbeard’s Pyrokinetics power is thus only useable for this involuntary attack, and always at maximum setting (Limitation). Further, Redbeard’s mutating power is very taxing to use (Limitation) and he will regularly have to recharge his abilities by resting. The effects of Redbeard’s mutations are seemingly permanent. The army of Johnny Redbeard’s creations will therefore only grow slowly although steadily over time. Johnny Redbeard’s powers seem to be bound to his physical form and so When Chelsea Nirvana had been fully changed into an exact copy of Johnny Redbeard it is reasonably to assume to that all her Physical stats and Powers were the same as the original’s. Their modus operandi, speech etc. also seemed to become the same so completely identical stats are a possibility. Just after taking over the identity of Redbeard, Nirvana physically changed and briefly received the Attractive Advantage, before slowly proceeding to the male Redbeard identity. However, as a scientific genius, the Nirvana-version of Redbeard would also always have the Gadgetry and Scientist skills at 10 and 8 APs, respectively. Unlike her father Nirvana aka Redbeard II did not have the Genius Advantage, and unlike her predecessor she did not have the Connoisseur advantage, but managed to teacher herself Expertise in Cloning. The Nirvana version also had a High-level Connection to the Frightening Force. All versions of Redbeard are leader of men with the Leadership advantage and the Charisma skill. As a side note: the Creator, of the Savage World, was quite different enough to warrant a separate write-up. 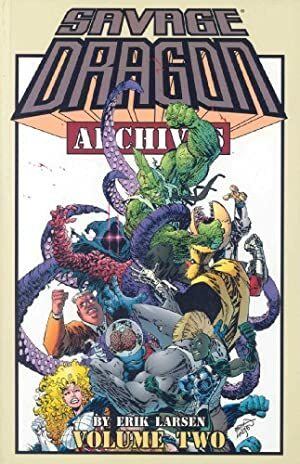 Source of Character: Savage Dragon comics. Helper(s): www.brotherhoodofthefin.net (defunct), KalEl el Vigilante, Capita Senyera.